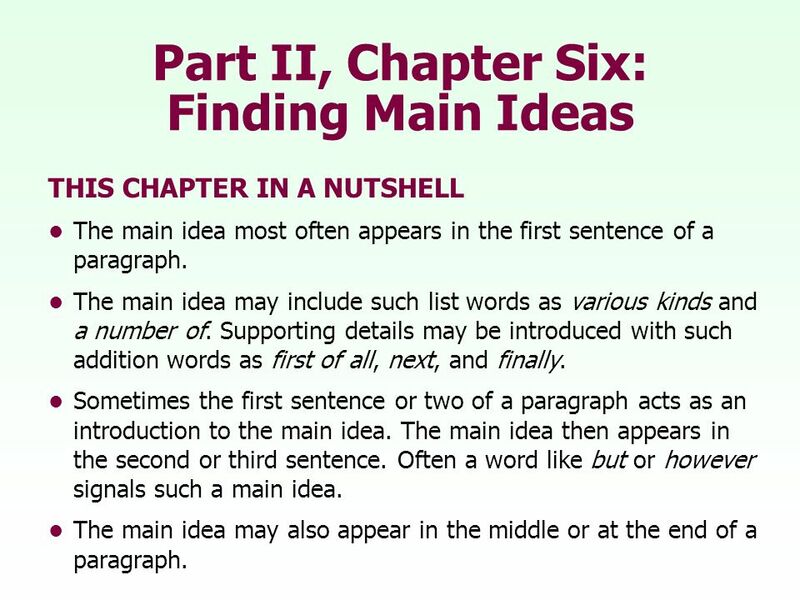 2 Part II, Chapter Six: Finding Main Ideas THIS CHAPTER IN A NUTSHELL The main idea most often appears in the first sentence of a paragraph. The main idea may include such list words as various kinds and a number of. Supporting details may be introduced with such addition words as first of all, next, and finally. Sometimes the first sentence or two of a paragraph acts as an introduction to the main idea. The main idea then appears in the second or third sentence. Often a word like but or however signals such a main idea. 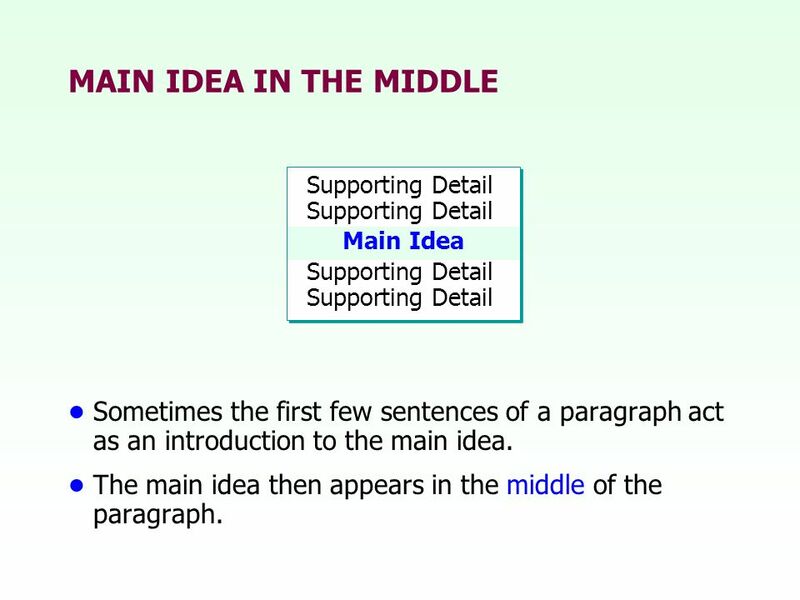 The main idea may also appear in the middle or at the end of a paragraph. 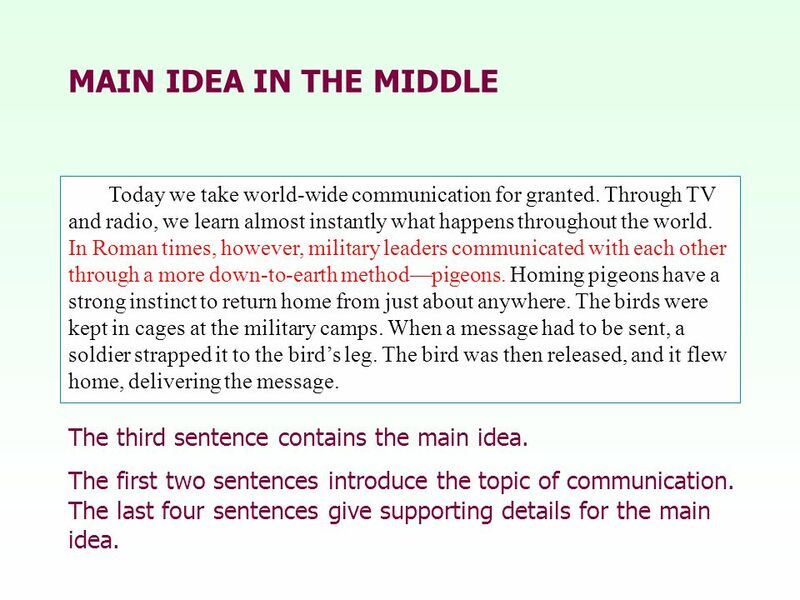 5 MAIN IDEA AT THE BEGINNING Which sentence contains the main idea? Many people say they have a problem sleeping. But in many cases, sleep problems can be avoided by following a few simple guidelines. First, dont drink alcoholic beverages or drinks with caffeine close to bedtime. Next, do not exercise within three hours of bedtime. Finally, plan a sleep routine. Every day, go to bed at the same time and get up at the same time. As you read the paragraph below, look for the general idea. 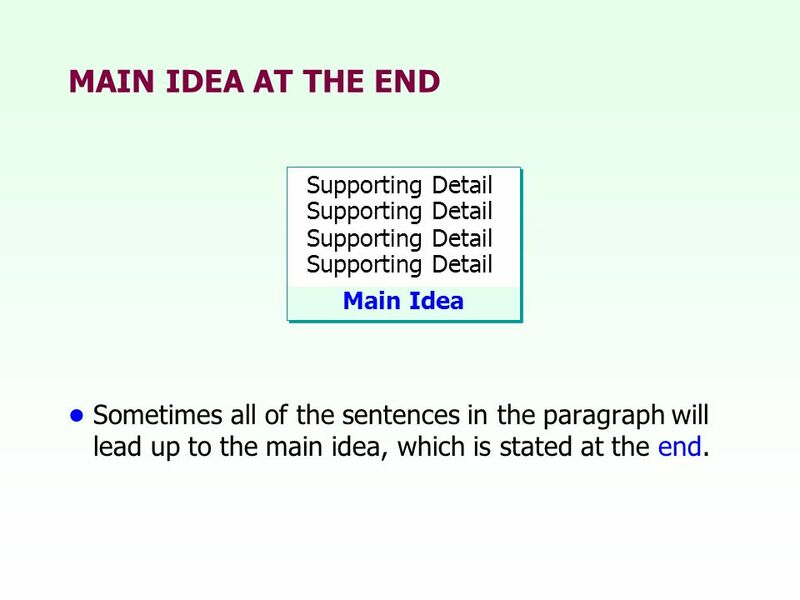 6 MAIN IDEA AT THE BEGINNING The second sentence contains the main idea. 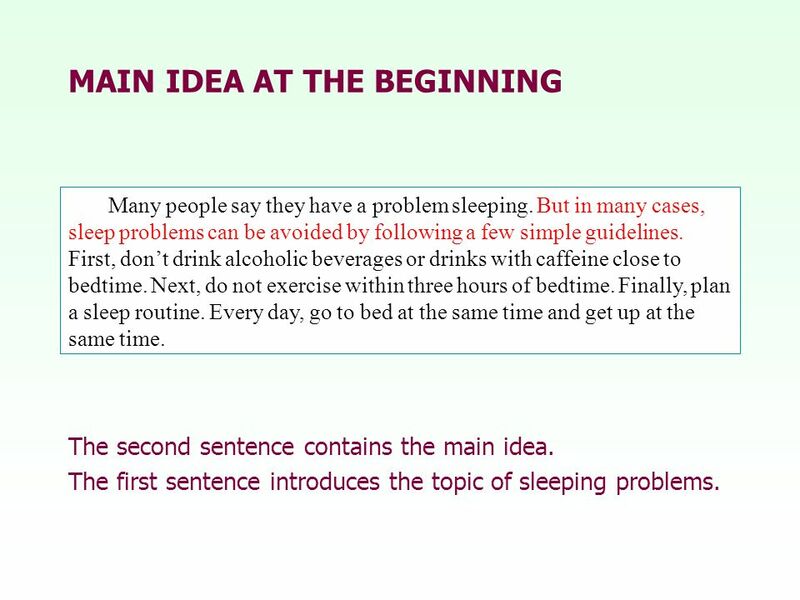 The first sentence introduces the topic of sleeping problems. Many people say they have a problem sleeping. But in many cases, sleep problems can be avoided by following a few simple guidelines. First, dont drink alcoholic beverages or drinks with caffeine close to bedtime. Next, do not exercise within three hours of bedtime. Finally, plan a sleep routine. Every day, go to bed at the same time and get up at the same time. 8 MAIN IDEA IN THE MIDDLE Today we take world-wide communication for granted. Through TV and radio, we learn almost instantly what happens throughout the world. In Roman times, however, military leaders communicated with each other through a more down-to-earth methodpigeons. Homing pigeons have a strong instinct to return home from just about anywhere. The birds were kept in cages at the military camps. When a message had to be sent, a soldier strapped it to the birds leg. The bird was then released, and it flew home, delivering the message. As you read the paragraph below, look for the general idea. 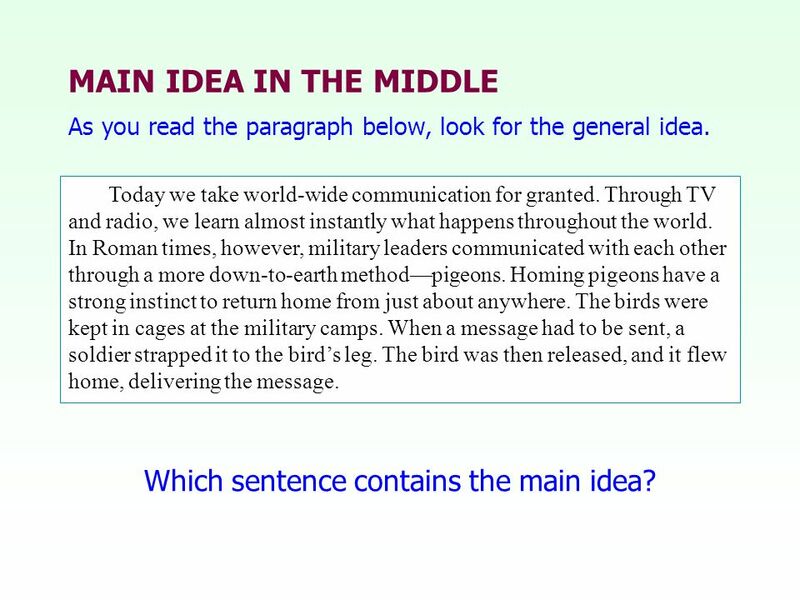 Which sentence contains the main idea? 9 MAIN IDEA IN THE MIDDLE Today we take world-wide communication for granted. Through TV and radio, we learn almost instantly what happens throughout the world. In Roman times, however, military leaders communicated with each other through a more down-to-earth methodpigeons. Homing pigeons have a strong instinct to return home from just about anywhere. The birds were kept in cages at the military camps. When a message had to be sent, a soldier strapped it to the birds leg. The bird was then released, and it flew home, delivering the message. The third sentence contains the main idea. The first two sentences introduce the topic of communication. The last four sentences give supporting details for the main idea. 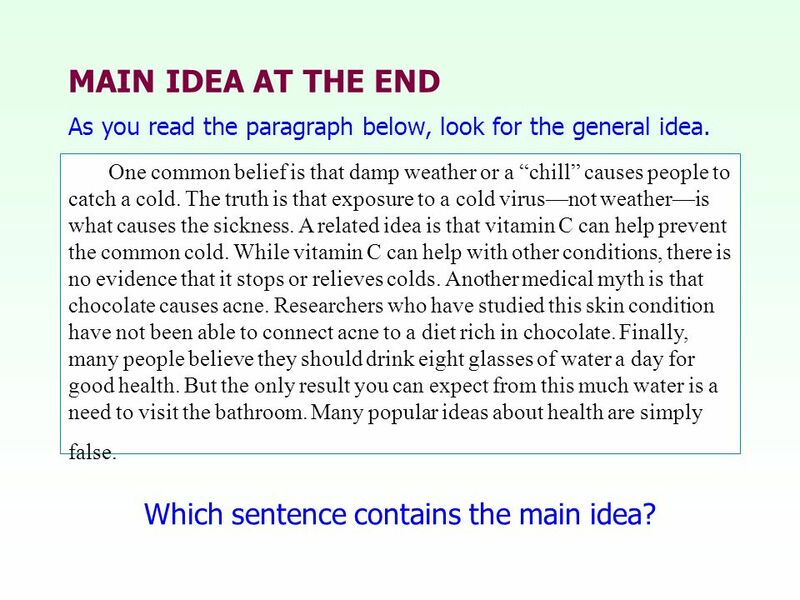 11 MAIN IDEA AT THE END One common belief is that damp weather or a chill causes people to catch a cold. The truth is that exposure to a cold virusnot weatheris what causes the sickness. A related idea is that vitamin C can help prevent the common cold. While vitamin C can help with other conditions, there is no evidence that it stops or relieves colds. Another medical myth is that chocolate causes acne. Researchers who have studied this skin condition have not been able to connect acne to a diet rich in chocolate. Finally, many people believe they should drink eight glasses of water a day for good health. But the only result you can expect from this much water is a need to visit the bathroom. Many popular ideas about health are simply false. As you read the paragraph below, look for the general idea. 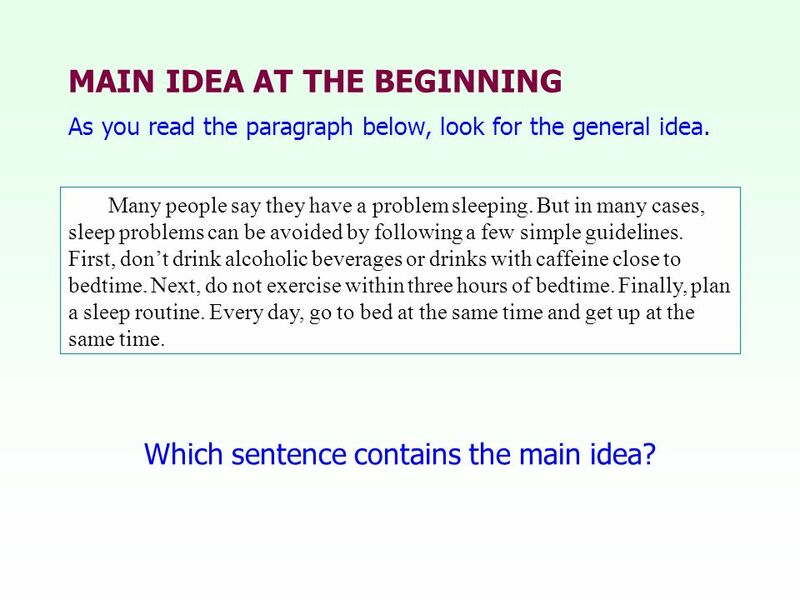 Which sentence contains the main idea? 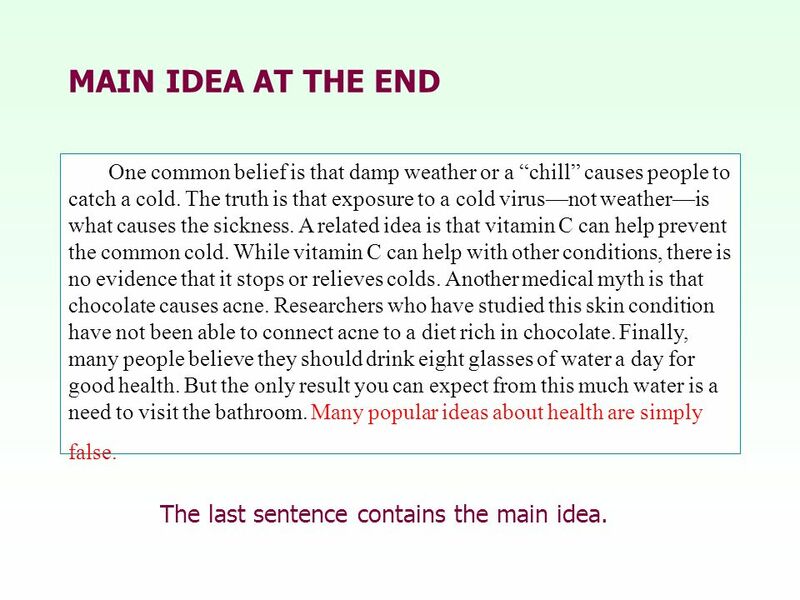 12 MAIN IDEA AT THE END One common belief is that damp weather or a chill causes people to catch a cold. The truth is that exposure to a cold virusnot weatheris what causes the sickness. A related idea is that vitamin C can help prevent the common cold. While vitamin C can help with other conditions, there is no evidence that it stops or relieves colds. Another medical myth is that chocolate causes acne. Researchers who have studied this skin condition have not been able to connect acne to a diet rich in chocolate. Finally, many people believe they should drink eight glasses of water a day for good health. But the only result you can expect from this much water is a need to visit the bathroom. Many popular ideas about health are simply false. The last sentence contains the main idea. 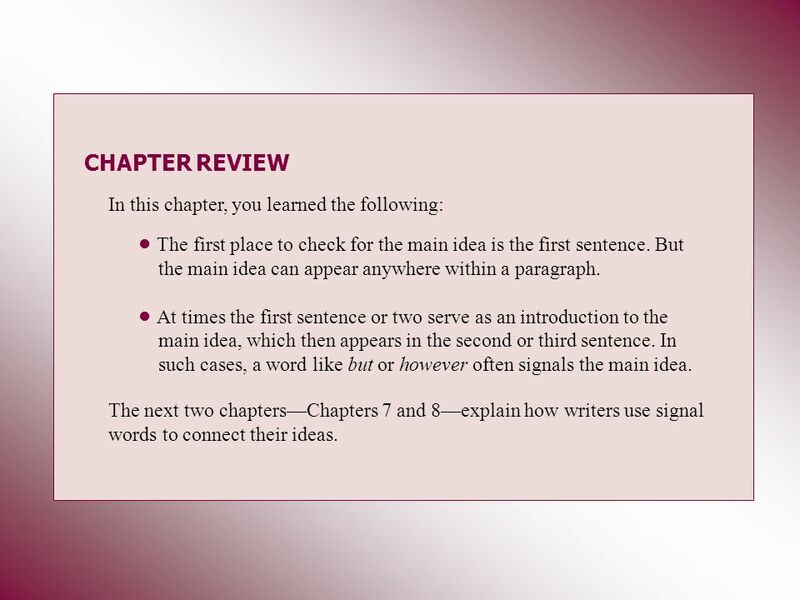 13 CHAPTER REVIEW In this chapter, you learned the following: The first place to check for the main idea is the first sentence. But the main idea can appear anywhere within a paragraph. At times the first sentence or two serve as an introduction to the main idea, which then appears in the second or third sentence. In such cases, a word like but or however often signals the main idea. 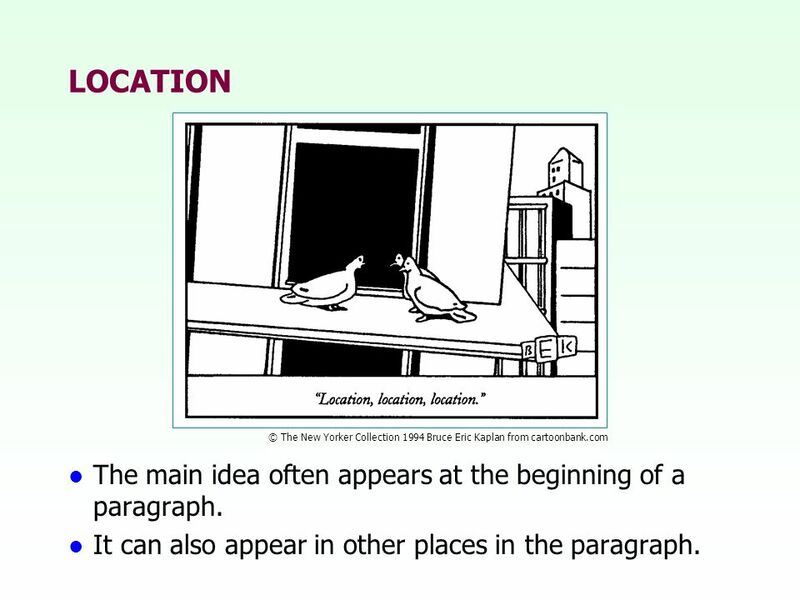 The next two chaptersChapters 7 and 8explain how writers use signal words to connect their ideas. 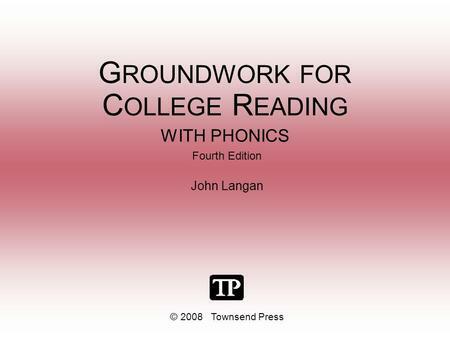 Download ppt "G ROUNDWORK FOR C OLLEGE R EADING WITH PHONICS Fourth Edition John Langan © 2008 Townsend Press." 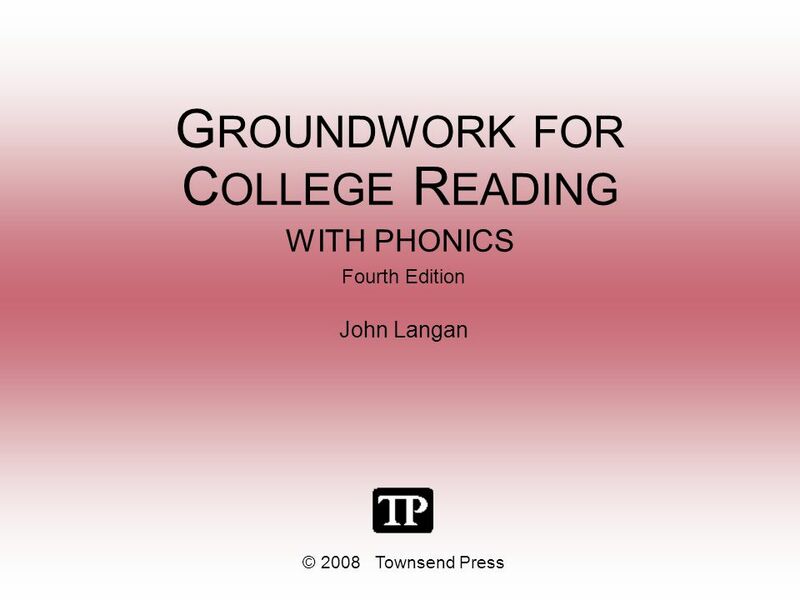 © 2008 Townsend Press Fourth Edition John Langan Fourth Edition John Langan T EN S TEPS TO B UILDING C OLLEGE R EADING S KILLS. Chapter 2 Your Health and Fitness In this chapter, you will learn. Writing I September 15, 2013. 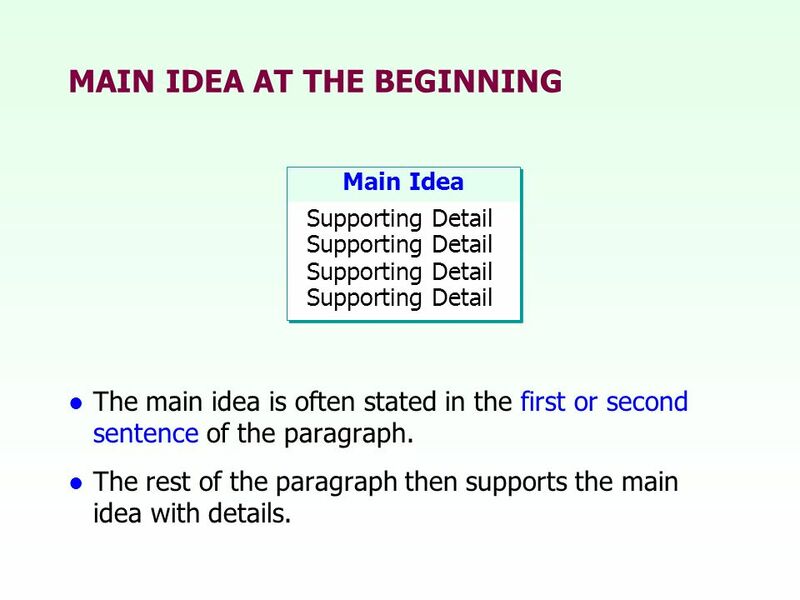 Paragraphs A good paragraph has the following key elements: A main idea expressed in a topic sentence (your reasons) Details supporting the main idea (your.